On December 12th it will release the second expansion pack for ARK entitled ARK: Aberration. 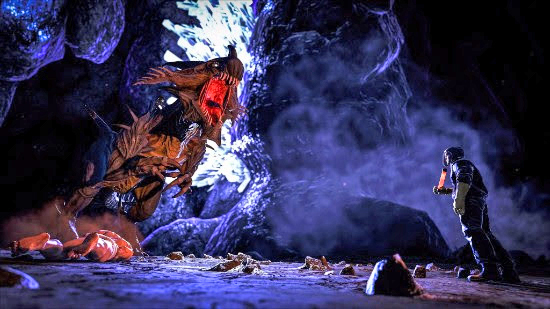 Survivors will wake up on Aberration - a derelict, malfunctioning ARK featuring with an elaborate underground biome system with new challenges unlike those found on prior ARK maps. Extreme radioactive sunlight and environmental hazards, ziplines, wingsuits, climbing gear, creatures like the Rock Drake and Lantern Pug, and more await in these vast caves. “Aberration” will be available as a standalone expansion pack ($19.99) and as part of the ARK: Explorer’s Edition (Season Pass). “Aberration” will be the second Expansion Pack for ARK: Survival Evolved, joining the desert-themed Scorched Earth map in continuing to shed light onto the vast mysteries of ARK! It will release worldwide December 12th for PlayStation 4, Xbox One and Steam. Haven’t yet explored the island of ARK? The massive hit survival game that's chock-a-block with over 100 prehistoric creatures, from dinos to mega-sharks, now has huge Black Friday discounts happening in both digital format and retail. Score this fantastically huge Jurassic-themed survival-adventure at a fantastic price! ARK: Survival Evolved: 50% off! The intense radiation of Aberration has led to incredible genetic mutations, resulting in new creatures with amazing abilities! Clamber up walls & glide through the air on the back of a camouflaging chameleon-like ‘Rock Drake’, keep the dark at bay with a friendly ‘Lantern Pug’, or grab and toss multiple creatures simultaneously with a massive ‘Cave Crustacean’, or -- if you are talented enough to tame one -- command the vile ‘Reaper Queen’ to impregnate your foes with a horrifying reproductive chest-burster!